Meet one of our Grand Opening Vendors, Heather Brandt. She will be set up at the Wellness Fair offering education on Young Living essential oils. "Heather Brandt is an essential oils consultant who helps her clients to unlock emotional wellness and physical strength through essential oils. She is passionate about educating and mentoring people in learning more about Young Living Essential Oils and how to use them safely to take charge of their health. She is a mama to 4 children and has a heart for empowering families with ways to use essential oils for supporting their children with special struggles." Meet one of our Grand Opening Vendors, Linda-Lee Murphy. She will be set up at the Wellness Fair offering education on homeopathy and herbs and may even have some tinctures available! You definitely don't want to miss talking to her! "I have a Bachelor's of Science from Bastyr university in Herbal Medicine. I studied Botany, Anatomy and Physiology, Biochemistry, Organic chemistry, Microbiology and Pharmacology. I also attended Dr. Herscu's NESH seminar covering basic homoepathic remedy prescribing. After college I moved to Louisville Kentucky where I have started to develop my stills into a business networking with other entrepreneurers and developing natural remedies. I started by making homemade vanilla extract. I now have my first herbal tincture blend. My product is superior to what is sold in the store because of the organic herbs I use and the ratio of herb material I am able to use per volume. My vanilla extract is a chefs quality vanilla extract made with about eight beans per cup of alcohol. My tinctures are prepared by hand and gram and volume are calculated in order to bring out the best qualities in the herbs that are used." Winter is a tough season for sickness. I don't like to depend too much on medicine so I use essential oils and other natural remedies around my house. Since I'm pregnant, I'm limited on the medicines I can take anyway so I rely heavily on the things below to keep me feeling healthy. A few notes before we get started: I don't get a flu shot and have not yet had the flu. I struggle with sinus and allergy issues and have seen results from these natural remedies. If you get caught with a cold or sinus infection, these remedies can help provide relief even if you are taking some medicine. Make sure you do your own research on anything and talk with your physician before you take it so you're well-informed. If you're pregnant or trying to get pregnant, talk with your physician first because many herbs are not safe to ingest during pregnancy. 1. Apple Cider Vinegar - this is great for cleansing your immune system and flushing out toxins. I don't like the taste but I add a spoonful to juice or water and shoot it down. Make sure you use unfiltered apple cider vinegar because that has all of the nutrients. Braggs is a great brand that I use and can be purchased at Kroger. The bottles are large but you only use a little at a time. 2. Essential Oils - Tea tree, peppermint and eucalyptus are my three go to oils when I'm feeling under the weather. You can put them in a diffuser to purify the air in your home, add a few drops to your humidifier, put a few drops in a hot steamy shower, or even put some in a bowl of boiling water and breath in the steam. There are ways to use essential oils in throat sprays and salves but make sure you ask your doctor or midwife before you use any essential oils. Tea tree oil is available for cheap at Trader Joes and I have purchased my essential oils at Rainbow Blossom and online in the past. I also asked for oils as a Christmas present and got some! 3. Tea - I drink Rooibus tea pretty much everyday. 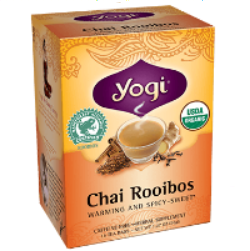 Often referred to as red tea or African red tea, Rooibus is a herbal tea made from a root in South Africa. It's full of antioxidants to keep you feeling great plus it also helps relieve stress and anxiety. Green and white teas are also full of antioxidants so drinking a cup or two a day can really help. You can also drink herbal teas which have a lot of immunity boosting support. Just make sure you research any herbs if you're pregnant because many are not safe. I like Yogi tea which can be found at Kroger in the organic section but there are so many other affordable brands out there. 4. Water - it is so important to stay hydrated. Drinking plenty of liquids helps to flush out toxins from your body. 5. Local Honey - Adding local honey to apple cider vinegar or tea really helps with sore and scratchy throats. Some people believe local honey can help with allergies. I've read mixed results but I do find that it helps provide me some relief. Rainbow Blossom and farmer's markets are mainly where I purchase my local honey. I hope that some of these natural remedies will help you this season!